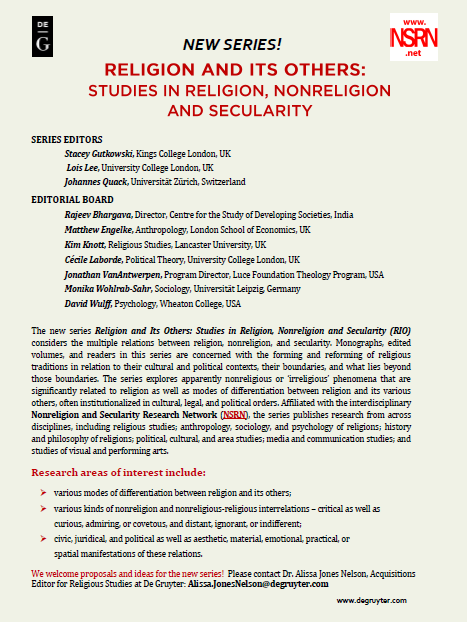 The new series Religion and Its Others: Studies in Religion, Nonreligion and Secularity (RIO) considers the multiple relations between religion, nonreligion, and secularity. Monographs, edited volumes, and readers in this series are concerned with the forming and reforming of religious traditions in relation to their cultural and political contexts, their boundaries, and what lies beyond those boundaries. The series explores apparently nonreligious or ‘irreligious’ phenomena that are significantly related to religion as well as modes of differentiation between religion and its various others, often institutionalized in cultural, legal, and political orders. Affiliated with the interdisciplinary Nonreligion and Secularity Research Network (NSRN), the series publishes research from across disciplines, including religious studies; anthropology, sociology, and psychology of religions; history and philosophy of religions; political, cultural, and area studies; media and communication studies; and studies of visual and performing arts. civic, juridical, and political as well as aesthetic, material, emotional, practical, or spatial manifestations of these relations. We welcome proposals and ideas for the new series!